There are SO many supplements out there and it can get overwhelming. Does my dog even need any? Well, if your dog has recurrent or occasional intestinal issues they could definitely benefit from probiotics. Probi-what? We are going to go break it all down for you and introduce you to a great supplement that has worked for us, Profivex®! 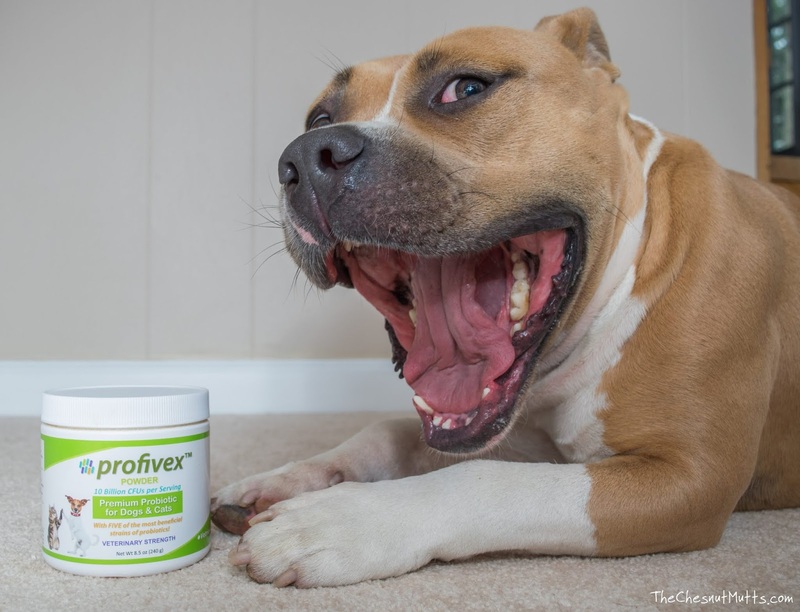 Vetnique Labs® is the company behind Profivex®. We have actually reviewed their other products, Glandex®, as well as Furbliss™. They strive to make high-quality, U.S.A. made products and we have been really impressed with each one we review. So, let's learn why probiotics are important! 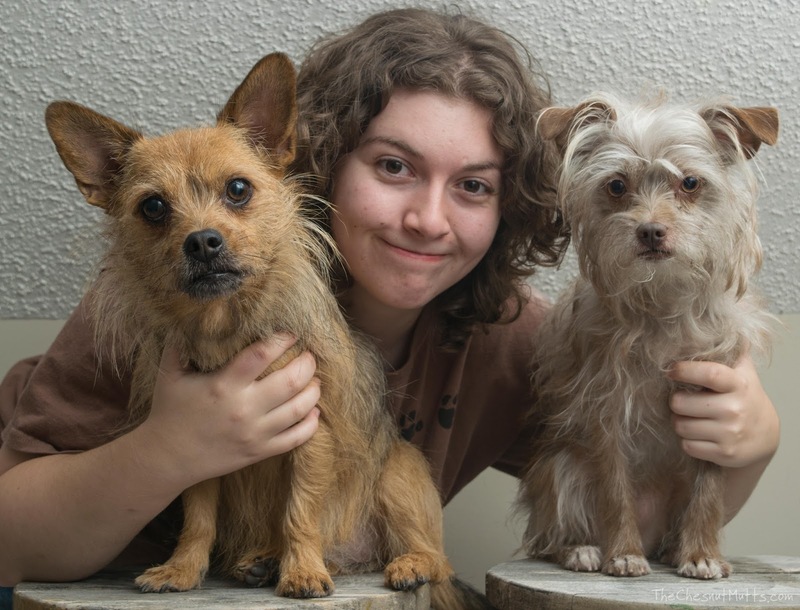 Microorganisms, called the gut flora, inhabit your dog's digestive system and help break down some hard to digest nutrients, gets rid of and prevents germs in the gut, is directly involved with the immune system when it comes to allergies, and even plays a part in the central nervous system. Most of these microbes live in the large intestine while very few live in the stomach and small intestine. You know when you are sick and have to take an antibiotic? This kills both the good and bad bacteria in your gut. This imbalance is what causes you to have digestive issues since the microbes that help digest aren't there anymore. This is why you eat yogurt which contains live bacteria cultures to get that gut flora up and running again. So, what is a probiotic? Probiotics are live bacteria cultures that are found in supplements and foods that can help with your dog's digestive system. They help even out the good and bad bacteria that make up the gut flora. A prebiotic is usually added because it acts as a substrate (something it can live off of) for the probiotic and promotes the growth of the good bacteria in the large intestine. Prebiotics cannot be digested and are typically a type of fiber compound. 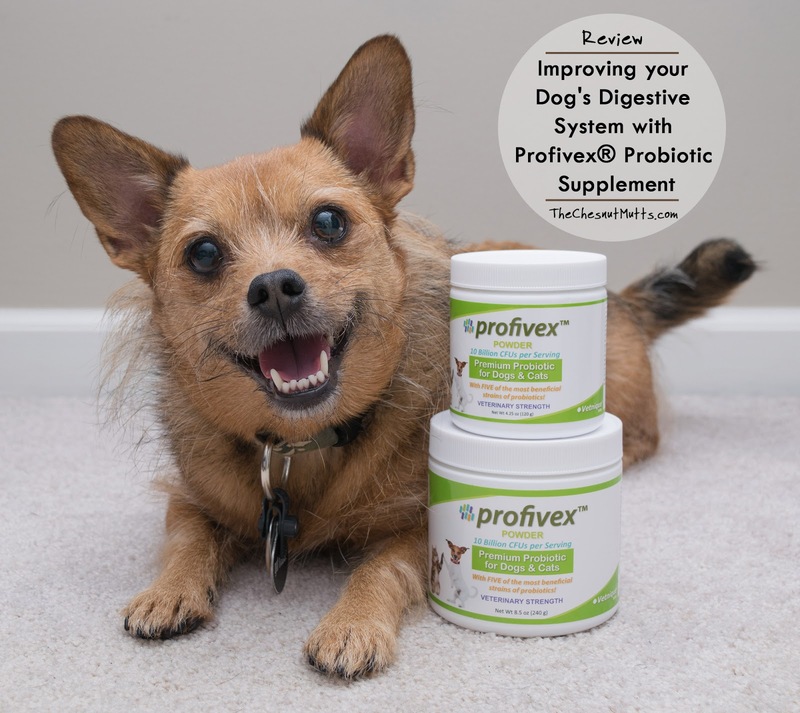 Profivex is a probiotic supplement for dogs and cats. It contains five strains of beneficial bacteria and two prebiotics to help cultivate them. These probiotics naturally occur in the body and according to Vetnique Labs, are the most beneficial strains for pets. For 2 scoops (4 grams) of the powder, you can get 10 billion CFUs (Colony-Forming Units) of these microorganisms. This is the number that the product starts out with at manufacturing, and over time will decrease since live bacteria will die off eventually. To help with shelf life, I would recommend keeping it in the fridge. The prebiotics include fructooligosaccharides (FOS) and sweet potato. FOS is a type of carbohydrate found in many plants and is not digestible. Along with the fiber of the sweet potato, they both provide a substrate for the probiotics to multiply in the large intestine. So to test out Profivex, I decided to see how it would work with Fezzik, my sister's American Staffie. He can be pretty gassy from both ends so this would be a good way to test the probiotics. I asked my sister to rate his gassiness on a scale from 1-10 and she gave him a 7.8. Yes, we are very precise over here at The Chesnut Mutts! Two scoops a day of what we called "Fezzik's Fart Powder" mixed into his food really made a difference! We tried it for 4 months and his gassiness actually went down on the scale to 0! Pretty amazing. He enjoys the pork liver taste and we enjoy his improved digestive system. 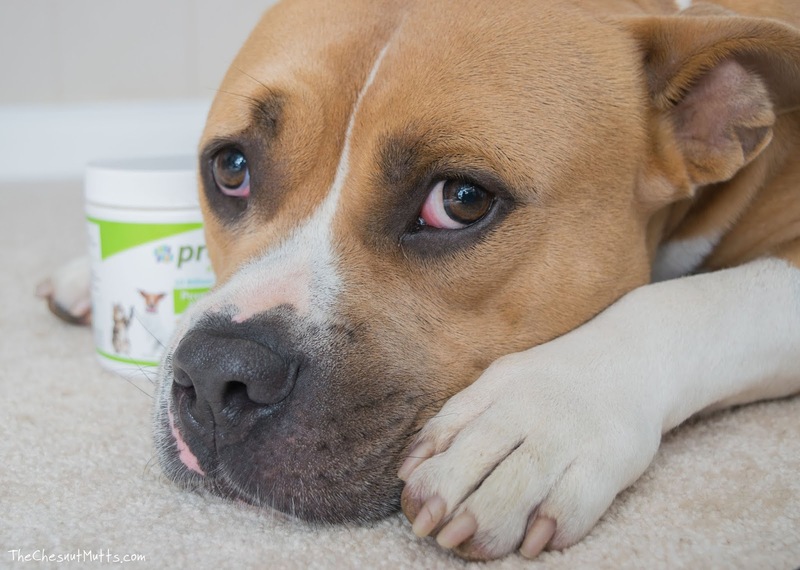 Probiotics can help balance out the good and bad bacteria in your dog's digestive system as well as benefit other parts of the body like the nervous and immune system. 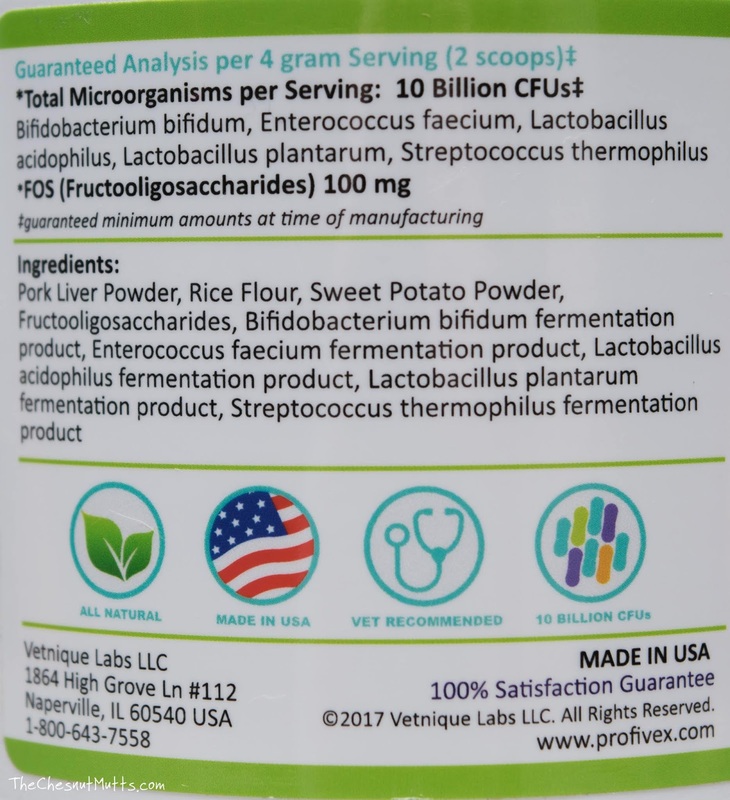 Profivex contains 5 active probiotic strains as well as 2 prebiotics. 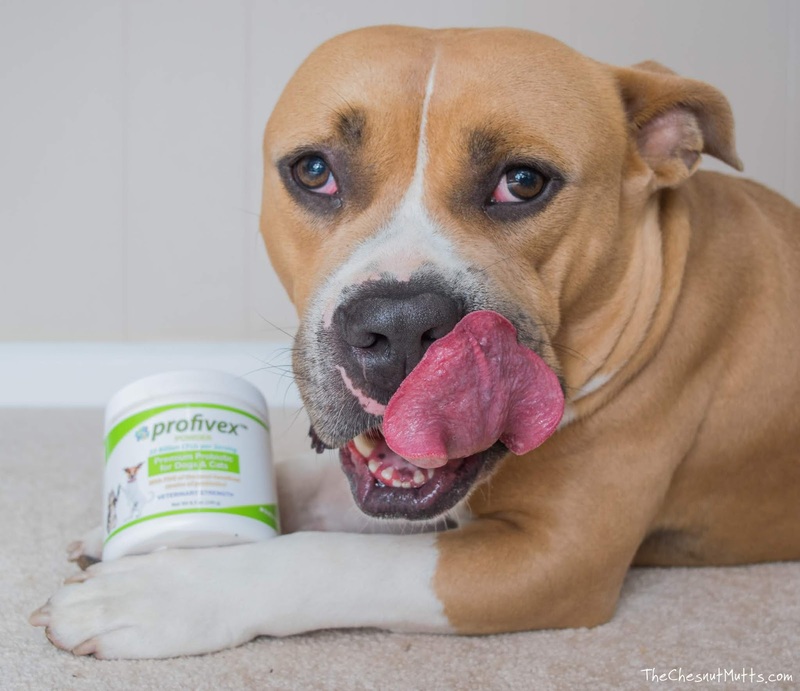 If your dog has occasional or recurrent GI (gastrointestinal) issues Profivex can be really helpful. 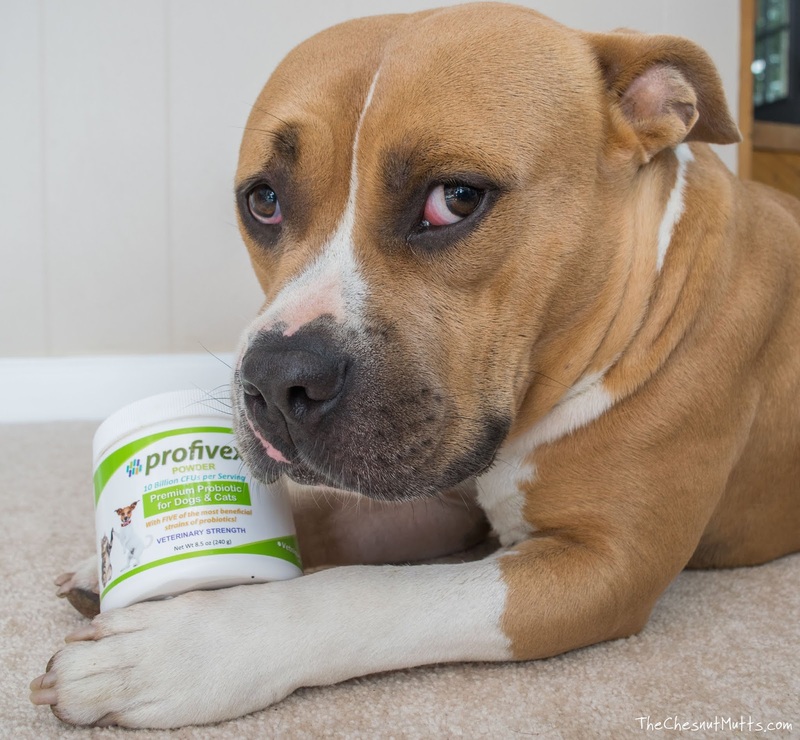 This can be used daily or whenever your pup needs a little probiotic boost. 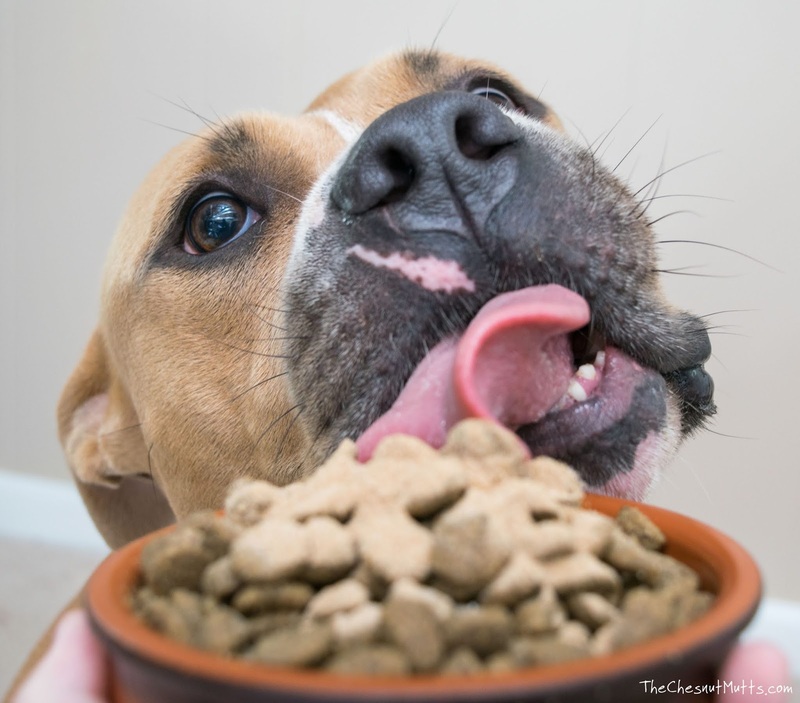 With improved digestion, your pet's overall health can improve as well! I'm always very wary of supplements since it can be hard to see a difference, but with Profivex I could tell it actually worked! I would definitely recommend this to pet parents with a gassy or even allergy prone pup. We give a high five for Profivex™! Would your dog benefit from Profivex? My Boston has been on a daily pre/probiotic since he was a puppy. 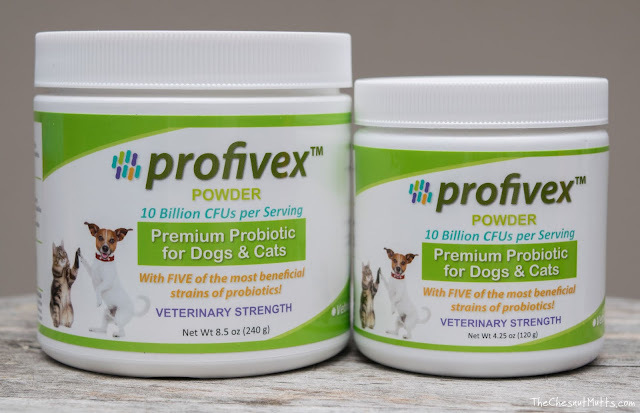 We've been using Profivex too and it works really well and is a bargain for small dogs with only a scoop a day. He eats homemade and raw and rarely has gas with Profivex.